The Saturday Six is a weekly look at the most interesting, most fun, and sometimes even the most outrageous things within the theme park world that we all love so much. Whether it’s the top six “secrets” of the Portofino Bay Hotel, the top six signature drinks, or even the top six outrageous food items at Universal, the Saturday Six will be your personal guide to experiencing the very best Orlando has to offer. This week’s Saturday Six looks at the Top Six New Additions to Universal’s Springfield USA. Using a staggered opening that began with Fast Food Blvd on June 1, 2013, Universal Studios Florida (USF) officially opened Springfield USA on Thursday, August 22. A spectacular addition to the park, Springfield USA brought several new things to the Universal Orlando Resort and fixed several of USF’s biggest weaknesses. Let’s take a gander at the top six, shall we? 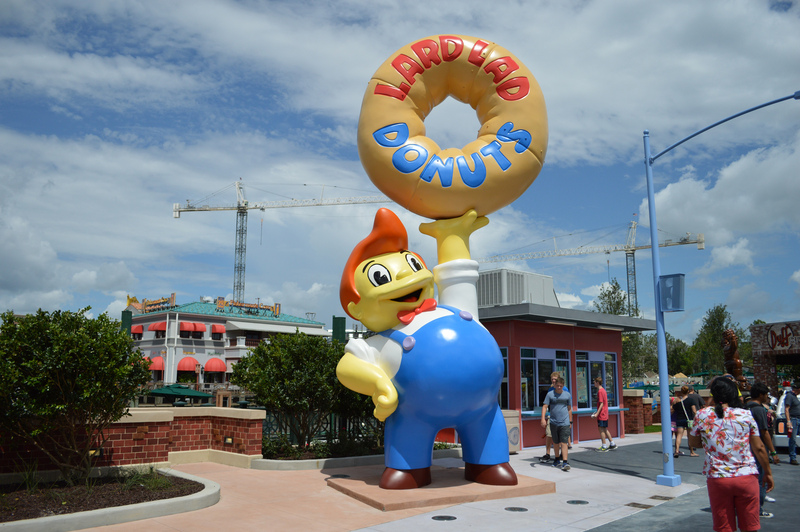 With Lard Lad (and his donut) standing taller than even Optimus Prime over at Transformers: The Ride-3D, this new donut shop tells you everything you need to know about Springfield USA. It’s big, it’s bold, and it’s a lot of fun. While the regular sized donuts are a little pricey, everything else on the menu gets a big thumbs up, with the highlight being a Brain Freezin’ D’oh-nut sundae. This marvelous creation involves an iconic pink sprinkled donut cut in half, and sandwiched in-between are soft serve ice cream and your choice of a topping. The toppings include Reese’s Pieces, Oreo cookie, caramel, hot fudge and more. Basically the er’s row of ice cream toppings. The flavor dynamic of the cold ice cream mixed with the warm donut added with your favorite topping? It becomes a signature treat so sweet that even the ruffians from Shelbyville will be making the trek to Springfield to get their hands on one. We’ve all noticed meet and greets developing into a larger part of the daily theme park experience, with many becoming so in demand that hour-plus long lines develop. Springfield USA made a huge breakthrough by sprinkling in several “statue” photo ops throughout the entire area. 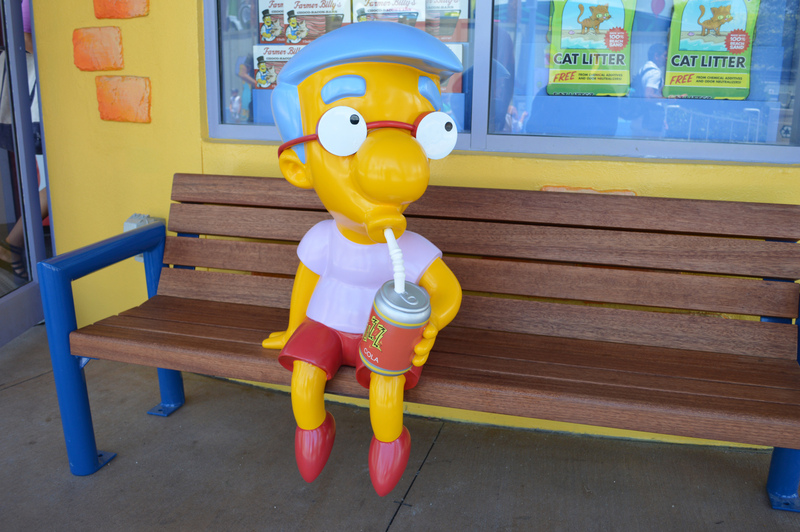 There’s Duffman over by Duff Gardens, Chief Wiggum standing by Lard Lad Donuts, and Barney Gumble inside Moe’s Tavern, but our favorite is good ol’ Milhouse sipping on a can of Buzz Cola outside the Kwik-E-Mart. Because the photo op characters like Milhouse don’t have set times or have to take breaks like normal characters, it allows guests to easily get a whole bunch of great pictures with little to no wait. 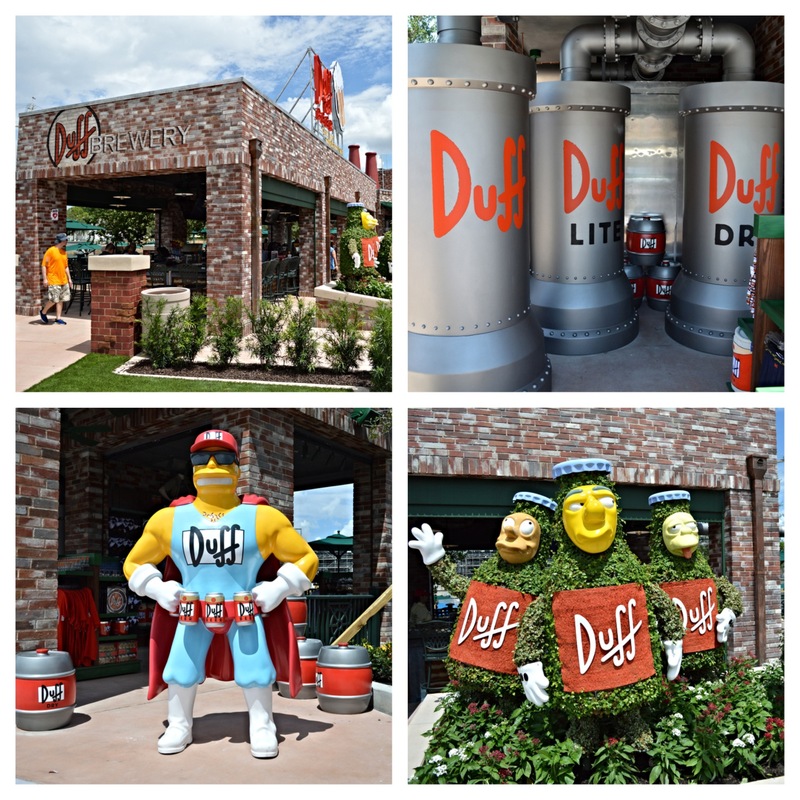 The success of these photo ops in Springfield makes it easy to imagine that similar concepts will be used by Disney and Universal in the coming years. With food trucks being a huge business in the “real world,” it’s only natural that this trend translates over into the theme park world. A food truck by design is exactly what a good theme park quick service location should be: freshly made food with a quick turnaround. There already is Cafe La Bamba in USF if you are looking for a southwestern meal, but there’s something to be said for the convenience of walking up to a food truck and getting your order (see menu) on the fly. It’s hip, it’s trendy, and the fact that the tacos from Bumblebee Man’s Tacos are actually good is icing on the cake. 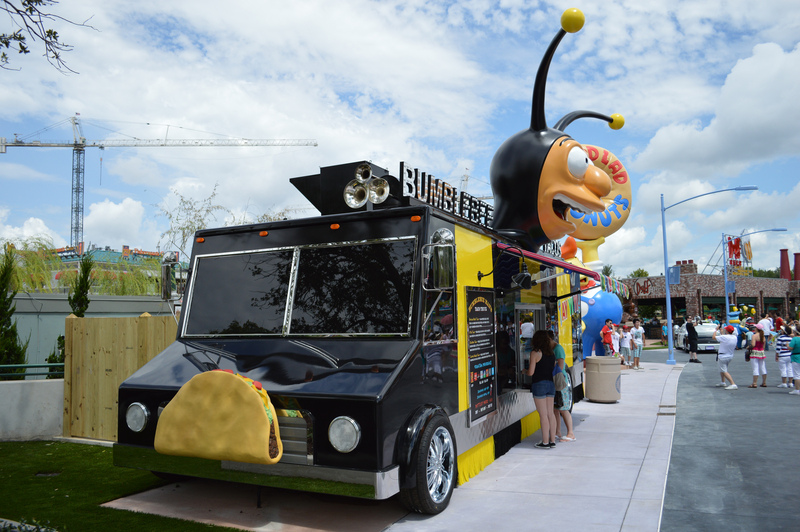 For too long theme park fans have settled for mediocre food and justified it (and its high price) with the excuse of “it’s theme park food.” Bumblebee Man’s Tacos shows you can make good food for a decent price in a theme park setting. No more excuses! I’ve also done a near 180 on the tables outside Fast Food Blvd. While the aesthetic of the area has changed, it’s not as bad visually in person, and it is really convenient to have these covered tables when you are grabbing food or drinks from the nearby area. One of the biggest complaints I have had about Epcot’s International Food & Wine Festival is that there just aren’t enough areas for people to relax and enjoy their actual food and wine. The few tables they have are way too small, and many people resort to putting their plates on top of garbage cans or to trying to eat and drink while they walk around. 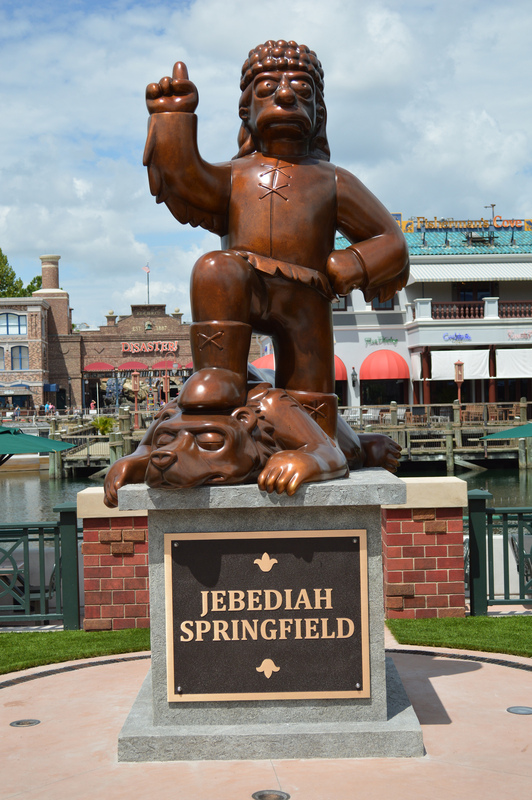 As a side note, Jebediah is actually the second man to have a statue sitting in Universal Studios Florida, as one dedicated to Lew Wasserman stands over in the New York section of the park. Wasserman was a major player in the Hollywood scene and bought Universal Studios (the movie company) in the early 1960s. It was Wasserman who green-lighted Universal Studios Florida being built in 1990. This area of USF had almost nothing going on around it for years, and now it has become a fantastic place to hang out with friends and family. At Duff Gardens you can also get reserved seating for the Universal Cinematic Spectacular nighttime show for a reasonable price of about $15, which includes a reserved seat, a cupcake, and a non-alcoholic drink. Until now, spinner rides have pretty much exclusively been targeted to kids. Whether it’s Dumbo over at the Magic Kingdom or One Fish Two Fish Red Fish Blue Fish in Islands of Adventure, there isn’t much in these type of rides for adults other than nostalgia. Universal finally broke the code and delivered a spinner that can be enjoyed by parents as much as their kids. With the trademark Simpsons style and wit, Kang & Kodos’ Twirl ‘n’ Hurl gives the younger set an attraction they can have fun spinning around and interacting with, while the adults will appreciate the in-jokes and dark humor. Opening Springfield USA accomplished three fairly large goals. 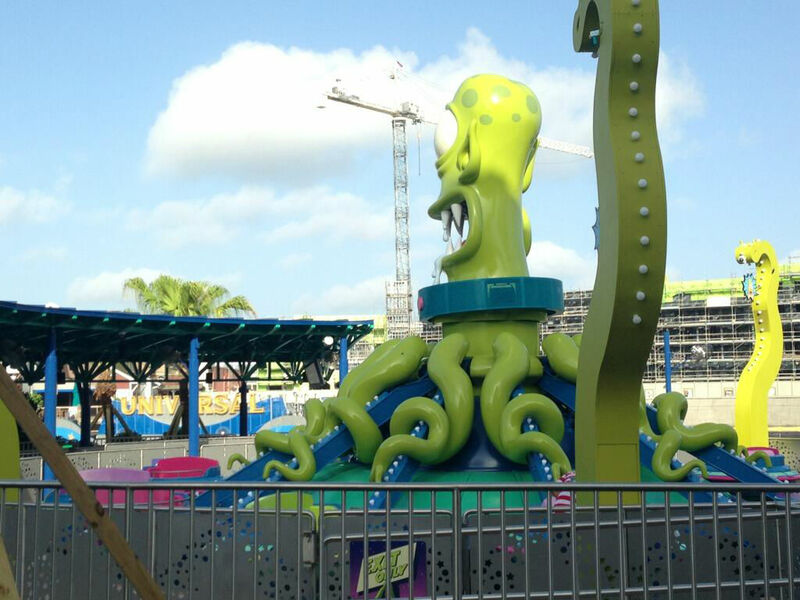 With Kang & Kodos Universal delivered a much needed ride that the whole family can enjoy. It also replaced the worst restaurant in the park (the International Film and Food Festival) with arguably the best food court in the history of theme parks with Fast Food Blvd. Universal also took a rather lackluster lagoon area and filled it with unique dining experiences and places where people can can sit down and enjoy the atmosphere. On top of all that, 28 new food and drink items were added – items that are only available in Springfield USA. Just incredible! So there you have it, the top six new additions to Springfield USA. See you next weekend for the latest edition of the Saturday Six. If you had fun, be sure to check out The Magic, The Memories and Merch! articles or head on over to the TouringPlans.com Podcast Network and check out Universal NOW! and Pardon the Pixie Dust. Wow, Derek! Thanks for all this great information. I have to admit I’m questioning our choice to skip Universal tickets this year. They sure are moving a lot faster than Disney with all the new stuff. I want to see all of this soon 🙂 We used to have Annual Passes to Universal, haven’t been in about a year and a half.